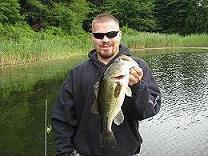 CTFishTalk.com: CT Fishermen Waiting for Second Shoe to Drop - Connecticut Conservation & DEP ( CT Conservation & DEP ) - A Community Built for Connecticut Fisherman. The DEEP is considering changes in minimum lengths, creel limits and/or season dates for no less than four of the top six fish caught in Long Island Sound -- fluke (summer flounder), blackfish (Tautog), porgies (scup) and black sea bass. Check the online version of the as-yet unpublished 2012 Angler's Guide and you will see that after the length, creel and season limits for those fish, the letters TBD appear. For those who are up to speed on code, that stands for To Be Determined. Hearings to gather public testimony on possible changes in regulations for the four fish species were held in February in Hartford. There is an additional open season for tautog from Oct. 10 to Dec. 6, with a larger creel limit of 4.